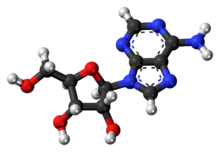 Adenosine (brand names Adenocard, Adenocor, Adenic, Adenoco, Adeno-Jec, Adenoscan, Adenosin, Adrekar, Krenosin; umwhile developmental code name SR-96225) is a purine nucleoside componed o a molecule o adenine attached tae a ribose succar molecule (ribofuranose) moiety via a β-N9-glycosidic bond. ↑ I.K. Morton; Judith M. Hall (6 December 2012). Concise Dictionary of Pharmacological Agents: Properties and Synonyms. Springer Science & Business Media. pp. 106–. ISBN 978-94-011-4439-1. ↑ J. Buckingham (1987). Dictionary of Organic Compounds. CRC Press. pp. 75–. ISBN 978-0-412-54090-5. ↑ Index Nominum 2000: International Drug Directory. Taylor & Francis. January 2000. pp. 18–. ISBN 978-3-88763-075-1. This page wis last eeditit on 30 September 2015, at 17:52.